Post after post we're covering VCP-DCV 2019 certification and the exam objectives which are the guidelines from the VMware Exam blueprint. Today's objective to cover is Objective 1.2 – Identify vCenter high availability (HA) requirements. One of the core VMware vSphere functionality. Today we’ll detail another objective towards VCP-DCV 2019 Certification – Objective 1.2 – Identify vCenter high availability (HA) requirements. Again, read the docs as well as we won’t be able to cover everything – make sure to read the PDFs. The VMware Exam blueprint has 41 chapters (Objectives). VCP-DCV 2019 certification is the latest certification based on vSphere 6.7. If you're new to this blog, worth to know that VMware changed the rules of re-certification recently. Our Post: VMware Certification Changes in 2019 has the details. No mandatory recertification after 2 years. Older certification holders (up to VCP5) can pass the new exam without a mandatory course, only recommended courses are listed). The certification’s name is “The VCP-DCV 2019 certification“. It is a new certification for 2019 focusing on installation, configuration, and management of VMware vSphere 6.7. The VCP-DCV 2019 certification will be based on 2V0-21.19 exam number and it will have 70 questions with a duration of 115 minutes. The passing score is 300. Nothing really new for those who are not new to VMware certification process. The current exam blueprint: (Original PDF Online at VMware is here 2V0-21.19). 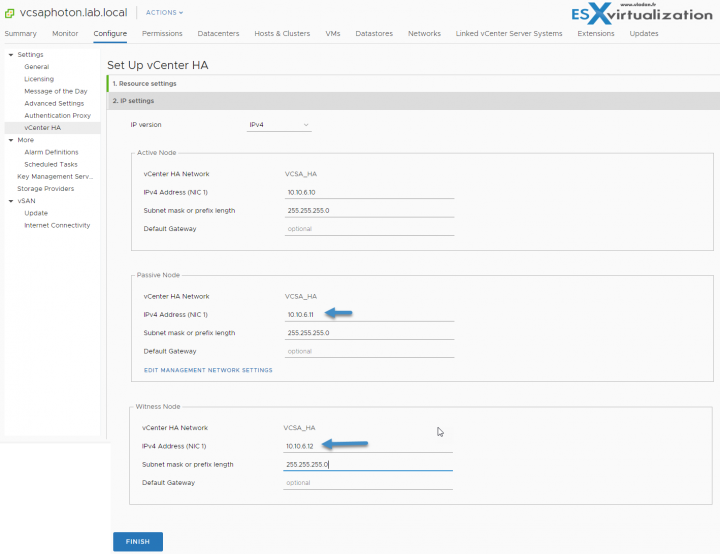 vCenter HA for vCenter server appliance (VCSA). It's in house VMware solution. vCenter HA for vCenter on Windows can be achieved with Microsoft failover clustering. VCSA HA with embedded Platform Service Controler (PSC) or external PSC? If you are using external PSC , you can put the PSC behind load balancer and protect agains failures. Overview of how it works. VCSA HA allows maintaining a standby copy of the VCSA which is ready to be powered on when the primary appliance becomes unavailable. Up to date data is replicated between the active and passive nodes. However, you’ll need at least 3 hosts in your environment, managed by vCenter server, to spread the different nodes. 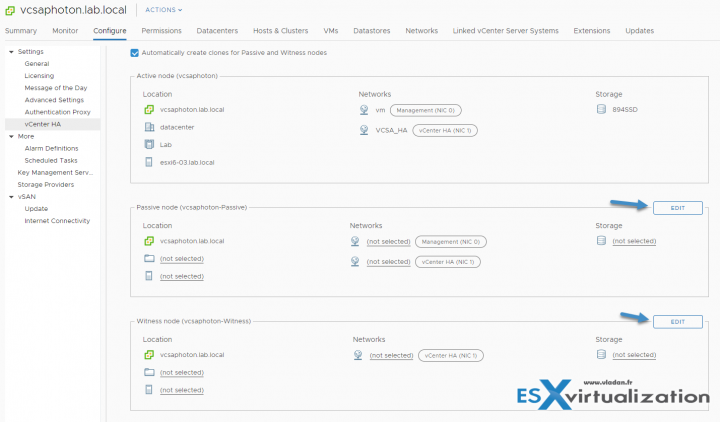 Remember that we have Passive VCSA as well as Witness nodes which must run on a separate ESXi host. When vCenter HA configuration is complete, only the Active node has an active management interface (public IP). The three nodes communicate over a private network called vCenter HA network that is set up as part of the configuration. VMware recommends that the VCHA nodes are deployed to a DRS enabled cluster containing at minimum three ESXi hosts. vCenter HA was introduced with the vCenter Server Appliance 6.5, but now with 6.7 U1 the process has been even more simplified. The vCenter deployment size should be 4 vCPU 16 GB RAM. A minimum of three hosts, running at least ESXi 5.5. The management network should be configured with a static IP address and reachable FQDN. The ESXi hosts must have 2 Networks (Port Groups) attached either to a Standard or a Distributed Switch. The HA network must be on a different subnet to the management network. A private network or VLAN dedicated to vCenter HA network traffic. Three private static IP's for vCenter HA network traffic. Network latency between the nodes less than 10ms. vCenter HA is compatible with both embedded deployment model and external PSC. If there is an outage to the active vCenter server VM, the passive vCenter VM automatically takes over the active role and identity, including networking. This feature is only available for VCSA, not for vCenter On Windows. Before starting the workflow, make sure that you create a new VM network which is on a different subnet or different VLAN than the management network. In my case, I have created a new VM network called VCSA_HA. Now, let’s start by selecting vCenter > Configure > vCenter HA > SET UP VCENTER HA. vCenter High Availability (vCenter HA) protects not only against host and hardware failures but also against vCenter Server application failures. Using automated failover from active to passive, vCenter HA supports high availability with minimal downtime. For maximum protection, place the nodes on separate hosts and datastores. If the nodes are placed on the same compute cluster that has DRS and/or SDRS enabled in automatic mode, anti-affinity rules are automatically created to keep the nodes separate. For best performance, the network latency between the nodes should be less than or equal to 10 ms. The wizard is greatly simplified when you have the checkbox “Automatically create clones for Passive and witness nodes” checked. Then on step 2 set the IP network for the Passive and Witness nodes. On the next page, we’ll see the networking option. You must be on different subnet, remember. If not the wizard will fail at the end. Scroll down the vCenter HA resource settings, review the network and resource settings of the active node of the vCenter Server. The system will automatically clone the VCSA. It takes some time depending on the performance of your infrastructure and the underlying storage. You can click the Recent tasks link to follow up on the cloning process and wait until all three nodes are up. After like 10 minutes of wait, in the end, you should see all the nodes with green checkboxes. VCSA HA is great however, you should know that the passive and witness nodes keeps running and so they consume resources such as CPU and storage. So, if you’re in a really small environment, do not use this method, but rather take a regular backup with your backup software or set up a file-level backup only. As you can see, the configuration is pretty straight forward. So we have covered VCP-DCV 2019 Certification – Objective 1.2 – Identify vCenter high availability (HA) requirements. This post covered not only the requirements but also a step-by-step installation. I hope you enjoyed it.